The HFP Summer Party is tonight! Anika and I look forward to seeing 250 of you tonight at the first Head for Points Summer Party, sponsored by Etihad Airways If you bought a ticket you should have received an email on Friday afternoon with all the details – check your spam box if you didn’t see it. Thanks to Etihad’s support, your first drink is free and Etihad will also be giving away a number of great raffle prizes. On an A380 from Heathrow, the winner will experience the impressive Business Class Studio which I reviewed here (pictured below) and was very positive about. 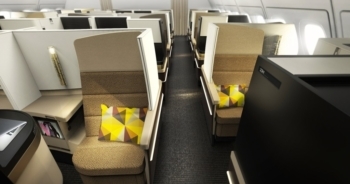 The seats turn into fully flat beds up to 6 feet 8 inches long, the IFE screen is huge 18 inches and Business Class passengers have access to the bar which is designed to have the feel of a Mayfair private club. The two runner up prizes are a football signed by Manchester City’s first team (i.e. the Premier League winners!) and a pair of general access tickets to a Manchester City game. A few Etihad staffers will be around if you want to learn more about the airline. There will also be a couple of people from IHG’s UK head office attending (Holiday Inn Camden Lock is our host) if you have any questions for them. Our luxury hotel booking guru Emyr Thomas will also be there if you want any holiday advice. See you later – a few photographs will follow later in the week. The saga of the Iberia 9,000 Avios rolls on ….. The saga of the ‘9,000 Avios for booking any Iberia flight, however cheap, and you don’t need to fly it’ promotion (see our article here) continues to rumble on. People with long-term Iberia Plus accounts have received their Avios, in the main. However, anyone who opened a new Iberia Plus account over the four days of the promotion is in a different situation. Most people who opened a new account have been contacted by Iberia and asked to provide a passport scan and copies of their ticket receipts. It was assumed that this was for fraud verification purposes, to ensure that people had not been opening accounts under fake names. Many (all?) people who do provide this data are now getting a follow-up email from Iberia saying that ‘inconsistencies’ have been seen in their bookings. Due to these unspecified ‘inconsistencies’ no Avios will be awarded. The flights booked can be cancelled but only by directly contacting Iberia to request it. It seems that people who provide a passport copy but not ticket receipts are not getting this message – but I wouldn’t hold out much hope of getting a different end result. This move is the first sign that Iberia may have messed up here and is desperately looking for a way out. I admit that I was surprised that the Avios for long-term members dropped in so promptly, but given that Iberia had taken to the airwaves to encourage people to book I doubt they had a choice. A view may have been taken that the airline has little to lose by telling people who only joined up in order to take advantage of this offer to take a hike ….. Already did that, a week and a bit ago. I think it’s because it’s a new account, that I spun up for the points offer. I did the exact same thing but still got the points. Some people have had luck by contacting upper management at Iberia. Sometimes they find a mismatch between your IB user name (first name + family name) vs your passport, which contains any middle names. Then use this to say ID does not check out. Well been awarded my points on a new account and 200 welcome ones, but cant use them. I have 27200 so was trying to use them for hotel bookings, but they will not go through. Have contacted them, passed to someone else. will see what the outcome is. I have a bit of time. I’m trying to book hotels on the Iberia site using Avios. Something odd is going on – yesterday there were loads of hotels available for Torremelinos and Cadiz, now there is just one for each location. Aside from why I might even want to stay in Torre, does anyone know what’s going on? I’m looking for early September but if I look right through to December, it’s the same story. How could loads of hotels be available yesterday and just one for each of those locations today?! i spoke too soon – they’re back now. What a wasted lunch hour, Interestingly, one that was priced at 23K Avios is suddenly 46K Avios but I guess you can’t really believe anything on the Iberia Avios site. Well managed to get my hotel bookings through this morning using the bonus Avios. Happy! After a week of IB saying that ‘your details don’t match’ and me saying, ‘yes they do – what doesn’t match on your system?’, plus ‘escalate this to a complaint’, they mailed me last night with a new PIN..
…and now they’ve dropped in the points..